For over 35 years, the work of textile artist Juanita Girardin has been honored and collected for its distinctive style and singular interpretation of techniques. Her quilted work has become known for its elegant minimalism , textured surface and fine garment finishing. Her hand-woven fabrics are distinguished by their unique patterning and color. Juanita received her foundation in weaving at RIT and in apparel design at RISD. She grew up in New England. For over 25 years she has lived in Northern New Mexico with her husband, artist, Larry Fielder, in their hand built adobe home with a bevy of cats and dogs. In 2003, after 30 years as a weaver, Juanita began to experiment with quilting fabrics for garments. 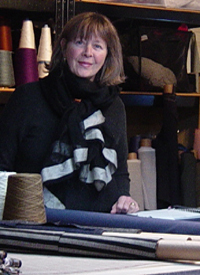 Since 2006, she has focused predominantly on experimental quilted cloths and garment making, occasionally doing a short run of hand woven scarves. Juanita has exhibited in and been a juror for America's most recognized craft events. She has been honored with awards at the Philadelphia Museum of Art Craft Show, the Smithsonian Craft Show, the American Craft Exposition, the St. Louis Art Fair, the Cherry Creek Arts Festival, and many other national events. Her work has been published in several national art & craft magazines. In her quilted textiles over the last thirteen years she has explored the disparate qualities of cloth and stitch to create surface texture and pattern. Various techniques are used to create cloths with folds, puckers, puffs, tears and textured & patterned surfaces and sub surfaces. Of her new work Juanita says: "When I began the quilted garments, I used abstract patterning to cover the entire garment and experimented extensively with various techniques to create texture. Later, I began to remove color and pattern to get to the essence of minimalism with additions of subtle, almost unseen marking. Recently, I've been working with reductive shapes and piecing to create blocks and lines within the garment. I work primarily with a Japanese sourced cotton and with silk. Often people don't realize the garments are quilted or the complex process involved in creating the work. Since each garment is one off, or very limited edition, the design alone require as much time as the making. " Each fabric is made by the artist individually in a labor intensive process of layering, quilting, washing and cutting. Construction of the garment is done by her expert garment sewer. Each fabric is made exclusively for an individual garment. Each garment has a modern shape with historical references that will compliment a contemporary wardrobe and withstand trends. All garments are limited edition or one of a kind. 2015: RAM, Racine Art Museum, Racine, Wisconsin, acquired a handwoven scarf for their permanent collection. 1993: U.S.State Department: "The Bangkok Collection:Cultural Fiber", U.S. Embassy, Bangkok, Thailand , two large woven pieces. 2012: Ornament Magazine, Spring Issue, Featured Artist, "New Directions"
Manchester Institute of Arts and Sciences, Manchester, NH publication. 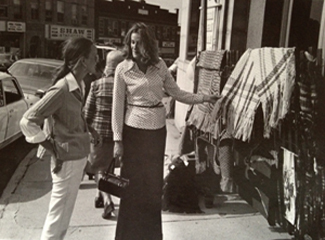 Here's a priceless photo of Juanita (skinny, long hair, on left) at her first craft show (mid'70's) with her sister Terry!